The meat of the book is the character options, taking up about half of the total page count of the book, this is character races, classes, personalities, backgrounds, equipment, and customization options. There's a lot of detail given to how to create a character, how to choose appropriate abilities for a character, and how to get your class right. Some things are much the same as they've always been in D&D. Character race is a set of abilities that you get at first level, and not much beyond that. The inclusion of races like Dragonborn and Tiefling do push the "traditional D&D" mold a bit, but this is a greatest hits of D&D player races and powers from the last fifteen years of the game. Each race is split into two or more subraces, allowing players to go one of two ways in their interpretation of the classics. (Wise Dwarves or Tough Dwarves? You decide!) Drow - that's Dark Elves - are back, for the record, and precisely as boring as ever. There's even a sidebar explaining how Drow are basically only an option because of Drizzt. Yawn. The real new component of character creation is the focus on character background and personality, with large chunks of the character sheet devoted to your character's personality traits, ideals, bonds, and flaws. That, along with a renewed focus on character alignments, give a forward-facing element to what was previously hand waved away in most D&D as "backstory." It's wise of the game to embrace a more roleplaying-centric view of play by giving players somewhere to keep track of that information. The other new element of a player character in 5th edition is a Background package that gives the player a handful of skill proficiencies and tools - it's about what your character did before becoming an adventurer. Backgrounds also give your character a feature, some power that ties them into the setting. A religious acolyte, for example, might have ties to their former church. A soldier might retain some privilege of high rank. The mechanical benefits of a background are great, and help players to think about what their character has done before the kickoff of an adventure. Otherwise, backgrounds provide lists of personality traits or ideals that are associated with characters of that type. While those are nice as examples, and to aid in fast character creation, the page space would have been more valuable as roleplaying instruction. Explaining to players how to build a rounded character and stick to that depiction over time would help more than a pile of examples. The game's classes are the absolute gem of design, though. They have a structured feel, with characters getting new powers and abilities at every level, but each manages to feel quite different from the others. They're loaded with little gimmicks, with magic, and with unique game mechanics that other classes don't use. 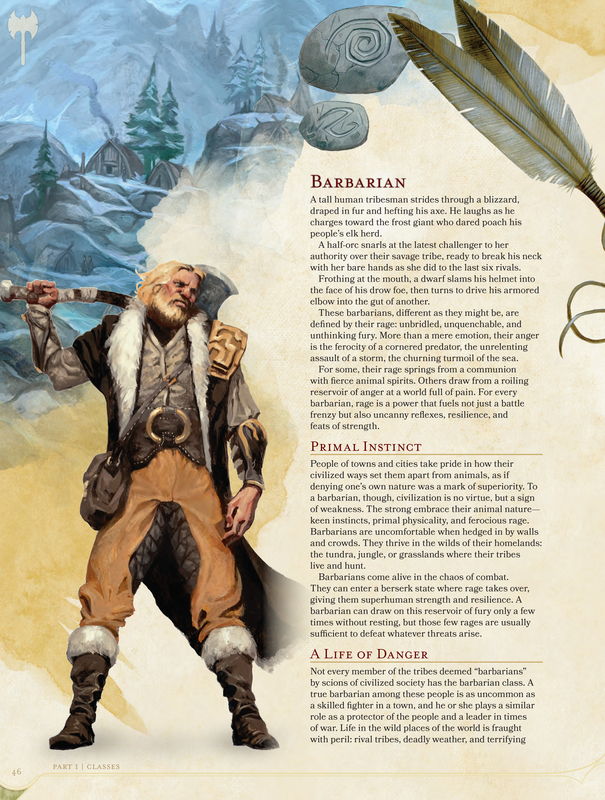 On top of that, each class has a handful of specializations, meaning your bard can be the classic magical songsmith or a melee-combat reveling battle skald. Your call. Many of the 4th Edition's powers make a reappearance as spells in one form or another, meaning that while the heavily delineated power structure is gone those cool legacy abilities do live on. A great example of this is in the excellently designed Paladin's smite spells, which boost its melee attacks. It's recognizably the powers structure from 4th, but built into classic D&D's spellcasting system. That said, the structured nature of the classes does have its downsides. It feels like nearly every player will have a few pools of resources to keep track of, whether it's the Battle Master Fighter's superiority dice pool or the wizard's spells per day. There's a lot of currencies being used by all the characters. It's a design legacy that carries through in all of Mike Mearls' prior work - starting with Iron Heroes and really showing up in force here. Players always have lots of things to do. Each character has a large amount of resources available to them, and managing those is a big factor in play. That's going to come down to individual player preferences, but it does make playing, say, a Sorcerer less attractive to players who just want to blow things up and not carefully spend their Sorcery Points making their spells better at key times. The upshot is that the resource game is well tended, and doesn't seem like it will be an impediment to play. Even the most management-intensive classes like Wizard or Warlock have the ability to recover some power mid play to keep the flow of the game up. There's a few stinkers in the classes, and a few powers that work the way they do For Legacy's Sake rather than for good play. The Barbarian's rage, for example, lasts precisely one minute. Why? Hell if it's apparent to me. 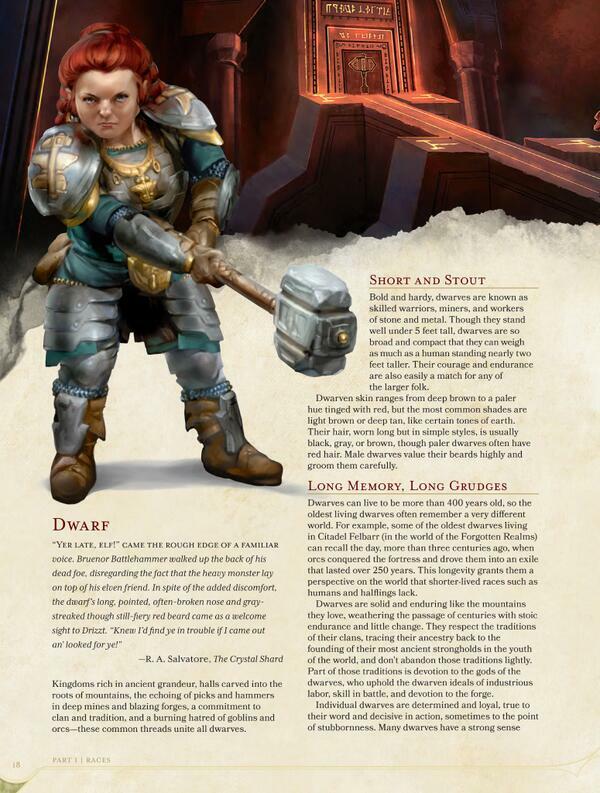 The Champion variant of the fighter should get called out as well, because while it's explicitly the class for hitting things with your sword, the Champion manages to make that the worst stereotype of boring Fighter play that D&D has. You hit things with your sword, and sometimes you hit harder. It lacks active abilities at all. The Ranger class also feels like a mess, with one variant getting a pet animal friend that seems less than effective, and another getting a handful of muted abilities that don't seem to fit any particular flavor. That said, the core of the class is solid, with unique spells and magic filling out the suite of cool powers the Ranger picked up in 4th Edition - much like the Paladin. Perhaps one of the slickest design tricks that the 5th Edition pulls is the ability score boost. Every few levels, more frequently for the Fighter and Rogue, characters can increase their ability scores, making them smarter or stronger or faster at general tasks. In lieu of these, characters can pick up feats, small packages of unique tricks - like being an expert at killing mages, casting spells in combat, or wielding a crossbow. They add a strong intersection of mechanics and flavor, but make sure there's a tradeoff for being the most special flower. Multiclassing is back to the way it worked in 3rd Edition, with players taking a level in a new class and getting those benefits. There's a few caveats - you don't necessarily get all the free stuff a new member of that class gets, for example. It's a very simple system, and pretty easy to understand if you're not combining a weak spellcaster with a strong spellcaster. Though it's classified as an 'optional component' of the rules, it'll likely get picked up by the majority of groups playing. Sort of a shame to see the elegant multi-classing of 4th Edition go out the window, but this system is relatively intuitive and works given the level structure of the game. It's not setting off fireworks, but it'll get the more niche character concepts onto folks' tables. Dipping into multiple classes aside, characters in 5th Edition are powerful. It's not hard to build a character capable of absolutely destroying most challenges they come up against - but the game simply embraces the fun of powerful characters. Power ramps up over the first few levels, teaching you slowly how to play your character by giving you a few abilities and making you more robust and able to take more chances. By level 3, you've got a potent and dangerous character that'll remind 4th Edition players of their starting hero. By level 5, you've got a character that hits what many would call the D&D sweet spot, able to best lesser foes in spades, but challenged by a dangerous single monster. We'll see about the higher levels when we get a Monster Manual.